Opal Glass has produced many specialized custom projects for commercial settings such as restaurants and schools, from transom windows to a 30 Ft red metal and Plexiglas flame that perched atop the Red Light. Sharon can work directly with you or your designer or architect to create a design that accentuates the theme of the restaurant or space adding the focal point of dramatic colors or minimalist clear textures with soft tints. Her artoworks have many times become the signature piece proclaiming the identity of a restaurant. 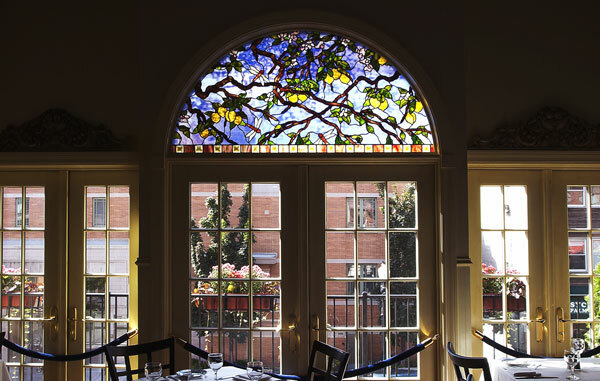 Case in point, the red Plexiglass flame created for the Red Light restaurant, the magnificent Lemon Branch arched window for Bistro Margot or the Pepperoni Pizza Rose window for the Medici, a longstanding Hyde Park institution. Opal Glass's services take into account financial and time based issues that are fundamental to development process of medium and larger projects. We are particularly sensitive to tighter budgets in providing year of experience to create works of extraordinary quality well within one's means.